Originally designed for world-famous pastelist Urania Christy Tarbet, this desk is the answer for the pastel painter who seeks convenience and organization. What looks like an unobtrusive hutch or TV console when not in use, blooms like a lotus into a variety of pastel storage trays and much needed workspace and storage area. 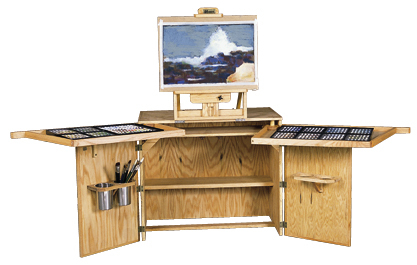 A quality adjustable easel is attached to the back of the desk and folds up and out-of-sight when not in use. Designed for the pastelist, Urania’s desk is a perfect companion for the oil painter or watercolorist as well. Closed height: 31". Closed width: 36". Depth: 20 3/4". 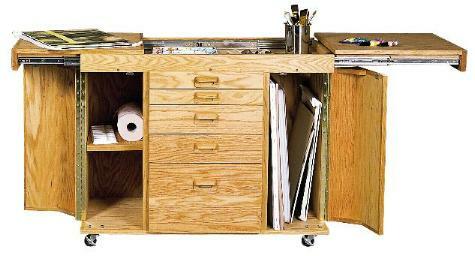 Features 26" x 18" x 1 1/2" pivoting drawers that will will hold a great variety of pastel sticks or paint tubes. Doors open to support weight of swinging drawers. 2 large stainless steel canisters are included with space available for an additional 2 canisters. Redesigned since this photo, the attached easel is mounted to the back of the desk and will slide out-of-sight for storage. Maximum canvas height: 36". Easel will adjust from flat to a forward tilt. Packaged in heavy duty carton for protection - Shipping weight: 116 lbs. Ships assembled by truck. box dimensions 25"x40"x34"
Height: 32 1/2". Closed width: 41 1/2". Depth: 20 1/2". Ideal for varnishing, gessoing or watercolor work. Mounted on front locking rubber casters for mobility. Offers 4 supply drawers of various depths to accommodate different size tubes, jars & other painting suoolies. Top surface and drawers are on smooth, full extension, metal bearings sliders for easy opening. Open the top for additional work space and storage area. Includes 1 large stainless steel canister. Front side doors open on brass piano hinges: right side offers 93/4"(W) x 25 3/4" (H) x 19" (D) storage area for pads, boards or canvas, and left side offers two 19" deep utility shelves. Closed, this unit will fit right into the decor of any room in the house and it will keep all painting supplies in one ready-to-use area. Packaged in heavy duty carton for protection - Shipping weight: 175 lbs. open the wings and discover a 20" x 40" workspace with two large stainless steel canisters off to one side. The wings have extra support with two fold-out arms that give them that extra Best touch. When closed , the top is a neat 20" x 20". 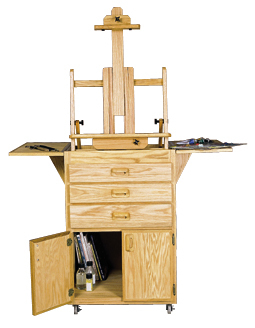 The Terrero features the ability to securely hold the Best Deluxe Table Top Easel. 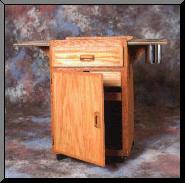 A tabret and easel combo. Very Practical!! Closed height: 37" Closed width: 24". Depth: 25". Side arms on side of unit support wings when opened. 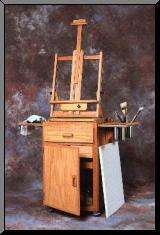 Attached fold out easel can be adjusted to desired position, including forward tilt. Easel width: 21". Maximum canvas height of easel: 44". Drawers are on smooth, full extension, metal bearing sliders for easy opening. The top drawer contains a 1/4" thick, 18" palette with a melamine surface and a fold out holder for the supplied brush washer #411250. Second drawer features peg locking device, for optional use as bottom canvas holder. Maximum canvas height using drawer: 44". Third drawer is deep enough for storage of canvas trays from easel when unit is in closed position. Packaged in heavy duty carton for protection - Shipping weight: 108 lbs. Ships assembled by truck. Casters must be attached when unit arrives to prevent damage in shipping.